Amazing home with tons of character and charm! 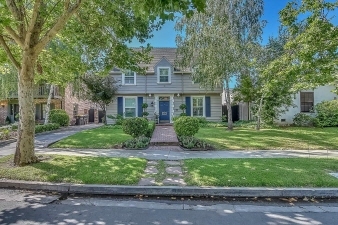 Stately Colonial 2-Story in highly desired UOP neighborhood. Remodeled gourmet kitchen w/ island, breakfast bar, built-in window seating. Formal dining rm w/crown molding. Formal living room w/ fireplace. Den w/ brick accent wall w/ wood beam ceiling. Master bedroom w/ bath , granite counters dual sink and stall shower & dual closets. Beautiful wood floors, plantation shutters, recessed lighting and much more! Back yard w/ raised garden planter boxes, gated driveway. Pride of ownership!